Inside WeWork's New York City headquarters on a Thursday morning, a handful of kids are selling radishes, kale and peppers. The children are "members" of WeWork's first school, WeGrow, where farming and agriculture is part of the curriculum. (CNN) - Inside WeWork's New York City headquarters on a Thursday morning, a handful of kids are selling radishes, kale and peppers. The children are "members" of WeWork's first school, WeGrow, where farming and agriculture is part of the curriculum. They are interacting with WeGrow employees browsing the goods: "How many cucumbers would you like?" one girl asks. "We take Apple Pay," another shouts. 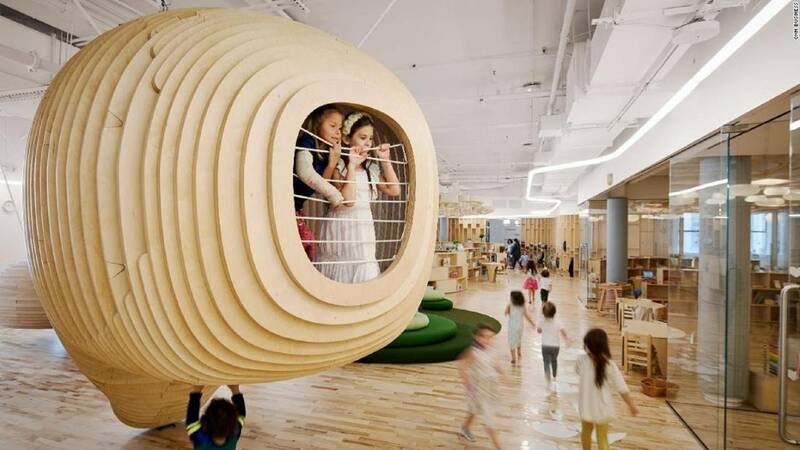 The older kids, ages 5 to 9, picked the crops the day before during their weekly jaunt an hour away to a farm owned by WeWork cofounder and CEO Adam Neumann and Rebekah Neumann, chief brand officer and founding partner at WeWork. Rebekah Neumann is also WeGrow's founder and CEO. WeGrow is WeWork's newest endeavor and its first foray into education. WeWork, founded in 2010, has made a name for itself as a global network of coworking spaces, charging customers more than $1,000 a month for space at its buildings that span more than 20 countries. The company has already raised billions of dollars in funding and is reportedly in talks to raise another round, which could value it at $35 billion. Its selling point is "community," and it has taken a heavy handed approach to determining what that should look like: It recently issued a company-wide meat ban, citing environmental concerns. WeGrow, which calls itself a "conscious entrepreneurial" school, is inspired by the Montessori approach to learning that gives children the freedom to discover and choose their activities, so their creativity and curious nature is preserved. But the goal is not to create next-generation startup CEOs. "Entrepreneurial is a bit of a trigger word for people," said Rebekah Neumann. "[We've] seen children do these things forever -- every time they've been running a lemonade stand, that's what that is." WeGrow opened its doors this fall after launching a pilot program last year. Currently, 46 kids are enrolled in classes from pre-Kindergarten to fourth grade. The private school costs between $36,000 to $42,000, depending on the age of your child, but 60% of its students are receiving some type of financial aid paid for by WeWork. WeGrow works with School and Student Services to access a family's financials and determine aid amounts. The kids start every morning with live music, followed by yoga and meditation. They spend time in nature and opt to take either Hebrew or Mandarin courses. WeGrow students learn science, math, social studies and language arts. The company has yet to determine what type of standardized tests it will incorporate to benchmark their progress. It also has a built-in mentorship program for kids to connect with WeWork community members with careers in areas kids might be interested in. Only about one-third of the students are children of WeWork employees or members, but Rebekah Neumann sees WeGrow as a way to bring its employees and their families closer together. She also calls it a key part of WeWork's ambitious core goals. "We want to make a world where people can work to make a life and not just a living, but that's part of a larger, more holistic mission to elevate the world's consciousness, to create a world where people are happy and fulfilled and living in a sharing state," Rebekah Neumann told CNN Business. When the Neumanns started to have kids -- now they have five -- Rebekah said it became clear how important it is to teach these values at a young age. "[WeGrow is] not really a departure from the [WeWork] mission at all, even though on the surface I can understand that it might look like that." In recent years, WeWork opened a gym, turned a Wall Street mailroom into a public speakeasy bar, and acquired companies, including community platform Meetup.com. It also bought Lord & Taylor's iconic department store on Fifth Avenue for $850 million to serve as its new headquarters. Despite its growth, the company is still trying to appropriately set its own culture. The Neumanns aren't alone in trying to reinvent education with the help of some venture capital. The Alt School, founded by former Google employee Max Antilla in 2014, is backed by powerful investors such as Facebook's Mark Zuckerberg. Its selling point is personalized education by merging technology with learning to understand and tailor to the needs of each child. It raised more than $130 million in venture capital and opened nearly a dozen schools in California and New York. But over the past year, Alt School shuttered some of its locations and refocused on selling its software to schools, a potentially more profitable endeavor. According to Larry Cuban, professor emeritus of education at Stanford University, businesses -- even those with the best intentions -- have to make money. "Alt School retrenching, cutting back, closing their school in Palo Alto and disappointing those parents who send their kids there, is one example," Cuban told CNN Business. Although WeGrow is able to get off the ground with the help of its parent company, it is optimistic about its future as a profitable endeavor. "It will eventually be able to sustain independently for sure," said Neumann, who hopes WeGrow will some day exist in every city WeWork operates in. "We're going to take it one step at a time right now."